11 We browse the page to load a large size picture, the picture size is relatively large, we will see the browser to load the picture from top to bottom when the picture will be displayed until the picture is complete on the page, so that the image from the blank area To fully loaded process is more unexpected, the user experience is relatively poor. We use the solution is to first load a small thumbnail, it may only 1K or so, and according to the required size of fuzzy display, wait until the large size of the picture to download a good and then complete the show large picture. This gives the user the feeling is to load the fuzzy picture, and then become clear picture, picture loading process fluently, greatly improve the user experience. 3 Projects often require some headache functions, as developers should organize its own library, when you need it can be copied. The authors collected dozens of commonly used functions in PHP project, guaranteed to run properly, you just copy and paste into your project. 1 The mobile Internet era, we can pass the information "sweep swept away" feature to easily get in the mobile terminal needs. Today I have to share a WEB function, it is a small floating toolbar on the right side of the page, we can use it to quickly locate the page up and down position, you can eject the micro-channel or two-dimensional code page address two-dimensional code, so like in the phone read on mobile devices and other friends easy access to information. First, we prepared the right side of the floating layer content, toolbar has up and down arrow button, and then a "feedback" link, you can click on the feedback information page of your site, there is a two-dimensional code button will pop up a two-dimensional slide on mouse code picture, then we use the two-dimensional code .popPanel to place pictures, .arrowPanel is used to make the direction of the arrow. In this example, I use a background image as a toolbar, the practical application of course we can also add more functions in accordance with the actual needs of the button. 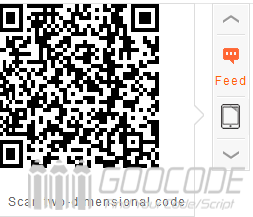 1 Two-dimensional code applications have penetrated into living and working among us, you only need a mobile phone in front of the two-dimensional code "sweep swept away" to get the corresponding information to help us understand the business, shopping, viewing and so on. This article will introduce a two-dimensional code generation based on jquery plugin qrcode, calling the plug-in page will be able to generate the corresponding two-dimensional code.